In this article we will discuss about manufacturing process. Documentations, Requirements and other formalities to start parenteral dosage form manufacturing company read by clicking this link. Parenteral Preparations are the preparations used administration by injections, infusions or implementations into body and directly injected into veins, muscles, under the skin or more specialized tissue such as spinal cord. These are sterile and pyrogen free liquids or solid dosage forms and may contain one or more active ingredients. Parenteral preparations are packed into either single dose or multi dose container. Both type of preparation follow different type of procedure for preparing parenterals. Vials are sterilized and pyrozen free by means of Terminal at temperature more than 300 degree. After Sterilization, Vials are filling with sterilized raw material. Continuous inspection and documentation is essential. After filling vials go for capping and sealing. Products shall be released only after complete filling and testing. Result of the tests relating to sterility, pyrogens, and Bacterial endotoxins shall be maintained in the analytical records. Records of environmental monitoring like temperature, humidity, microbilogical data, etc. shall be maintained. Records of periodic servicing of HEPA filters, sterilizers and other periodic maintenance of facilities and equipment carried out also be maintained. It is advisable to provide separate facilities for manufacture of Large Volume Parenterals in glass containers and / or plastic containers. For manufacture of Large Volume Parenterals in plastic containers, it is advisable to install automatic (with all operations) Form–Fill-Seal machines having one continuous operation. 1. General Specifications: General Sterile products, being very critical and sensitive in nature, a very high degree of precautions, prevention and preparations and needed. Dampness, dirt and darkness are to be avoided to ensure aseptic conditions in all areas. There shall be strict compliance in the prescribed standards especially in the matter of supply of water, air, active materials and in the maintenance of hygienic environment. All sections and departments shall be clearly separated from each other. Change rooms with entrance shall have air locks and separate exit space from the aseptic area. Material transfer between aseptic areas and outside shall be through suitable airlocks or pass-boxes. Doors of such airlocks and pass-boxes shall have suitable interlocking arrangements. 4. Environmental Monitoring: All environmental parameters listed shall be verified and established at the time of installation and thereafter monitored at periodic intervals. 5. Garments: This section covers garments required for use by personnel working only in aseptic area. Outdoor clothing shall not be brought into the sterile areas. Only clean, sterilized and protective garments shall be used at each work session where aseptic filtration and filling operations are undertaken and at each work shift for products intended to be sterilized, post-filling. The mask and gloves shall be changed at every work session in both instances. 6. Sanitation: There shall be written procedures for the sanitation of sterile processing facilities. Employees carrying out sanitation of aseptic areas shall be trained specifically for this purpose. 7. Equipments: The special equipment required for manufacturing sterile products includes component washing machines, steam sterilizers, dry heat sterilizers, membrane filter assemblies, manufacturing vessels, blenders, liquid filling machines, powder filling machines, sealing and labeling machines, vacuum testing chambers, inspection machines, lyophilisers, pressure vessels etc. suitable and fully integrated washing sterilizing filling lines may be provided, depending upon the type and volume of activity. 9. 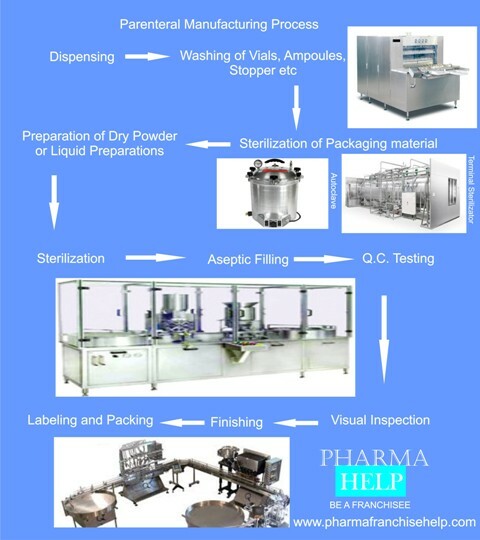 Manufacturing Process: Manufacturing of sterile products shall required defined conditions and environment. 10. Form-Fill-Seal Technology or Blow, Fill-Seal Technology: Form-Fill-Seal units are specially built automated machines in which through one continuous operation, containers are formed from thermoplastic granules, filled and then sealed. Blow, fill-seal units are machines in which containers are moulded / blown (pre-formed) in separate clean rooms, by non-continuous operations. 11. Product Container and Closures: 1 All containers and closures intended for use shall comply with the pharmacopoeial and other specified requirements. Serial number of the Batch Manufacturing Record. Reference to Master Formula Record. Date of commencement of manufacture and date of completion of manufacture. Date of manufacture and assigned date of expiry. Date of each step in manufacturing. Names of all ingredients with the grade given by the quality control department. Control reference numbers for all ingredients. Time and duration of blending, mixing, etc. whenever applicable. PH of solution whenever applicable. Records of plate-counts whenever applicable. Results of pyrogen and/or bacterial endotoxin & toxicity. Results of weight or volume of drug filled in containers. Bulk sterility in case of aseptically filled products. Sterilization records including autoclave leakage test records, load details, date, duration, temperature, pressure, etc. Total number of containers filled. Theoretical yield, permissible yield, actual yield and variation thereof. Clarification for variation in yield beyond permissible yield. Reference numbers of relevant analytical reports. Details of reprocessing, if any. Name of all operators carrying out different activities. Specimens of printed packaging materials. Records of destruction of rejected containers printed packaging and testing. Signature of competent technical staff responsible for manufacture and testing.